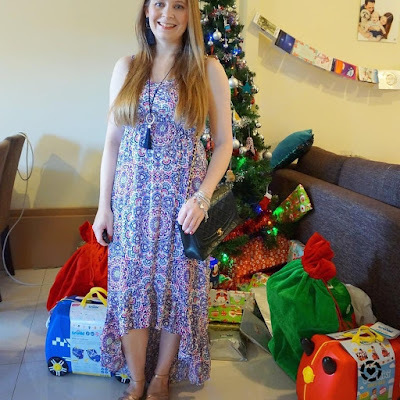 We dress up for Christmas Eve and then keep it a little more casual for Christmas Day, although I still made some effort as in Germany there are three days of celebration with various parts of the family on each day. Your Christmas Eve outfit is so cute! I love that Santa tee. The maxi skirt you paired it with is lovely as well. Chic bag and shoes options too. The dress you got for Christmas is beautiful. You look lovely in both outfits. I'm happy to hear you had a wonderful Christmas. Mine was nice as well. Love the cute tee and dying over that Chanel bag. Happy New Year! 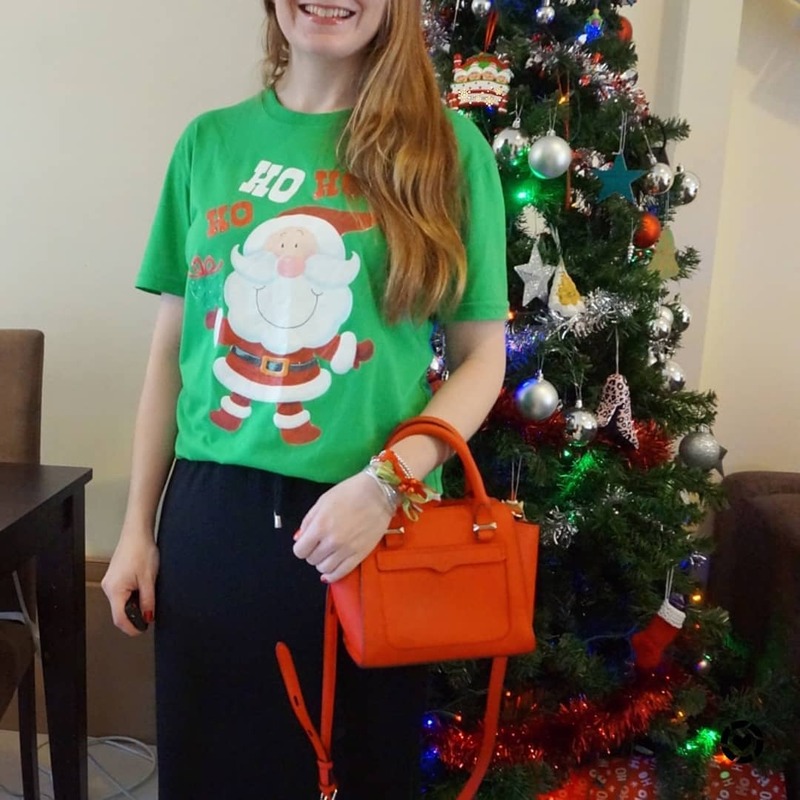 I love the Christmas tee, Mica!! We tend to do the opposite and dress up more for Christmas Eve. It just depends on what we plan for the day!! I'm glad the hosting went well on Christmas! It really can be stressful to get everything ready on time for a large group - especially with little ones afoot. So glad to hear it your Christmas was a success overall, and that Chanel bag is so gorgeous! That santa tee is soooo adorable! 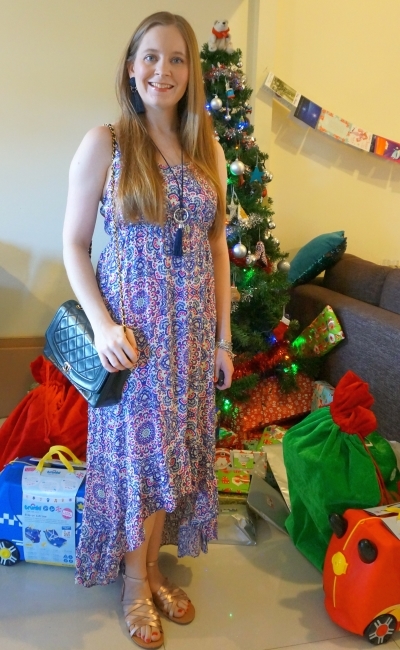 Love how you dressed it up with the maxi :) Hope you had a very merry Christmas! I just got back from a week long stay with my parents which was very nice to be able to spend the holiday with them since I only see them a few times a year! the outfit looks so lovely, i love the jewelries too. Love the Santa tee! So cute and I am happy you wear it every year! Your Christmas sounds and looks like a wonderful time for family. Love the Rebecca Bag in red and your new high low dress! Enjoy these festive days! As I look at the pictures i can only admire that pretty hair ! Sometimes the day is just too busy to take pics! 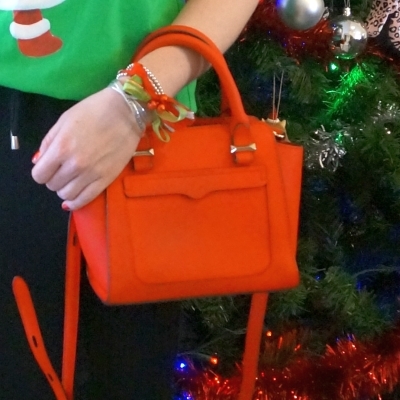 fun Christmas style! super cute! Thank you! This tee is so fun as it has a little glittery sparkle on it, although it's coming off year by year, haha! That Chanel bag is just so gorgeous!! Glad you all had a casual and enjoyable Christmas! Both of your outfits are really cute! I love the Santa t-shirt and how you dress more casual for Christmas Eve. And that's great that you treated yourself to a new dress for Christmas this year! I'm glad you and your family had a wonderful Christmas! Such cute looks! I love that little Santa tee! Ha ha, wel you look gorgeous with or without curls! I love a low high hem line, fabulous dress! And that tee is so much fun! I love your Santa shirt - that's so fun for Christmas. And I hope you had a good holiday and that all went well with hosting. I hosted Easter dinner this year and it was soooo much work! I adore the maxi dress! Such a beautiful print and those golden sandals are ideal for a warm Christmas! Have a Happy New Year, gorgeous!!! That maxi dress is gorgeous! I really like the hi-low hem! Your Christmas tee tradition is really cute! Glad to hear you had a great Christmas. Thanks Sasha! I love how well the earrings and necklace go together! 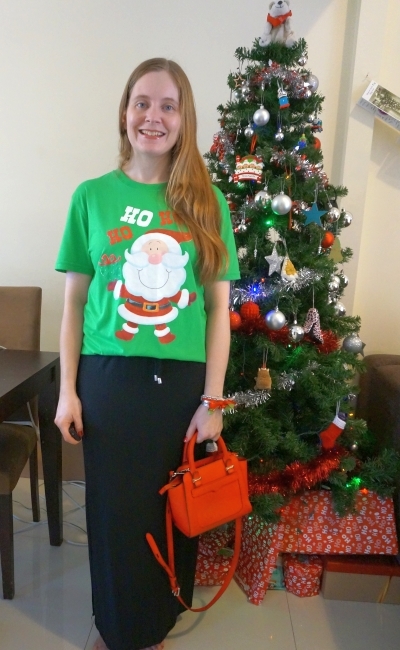 Love the Santa t-shirt and how you dress more casual for Christmas! Love both of the looks! I like simple and casual looks! You're always so pretty Mica! I am so jealous that you get to wear summer clothes every Christmas, it's so cold here at the moment, I don't like it at all!! I miss my summer dresses!! I love that you wear the same T-shirt for Christmas every year. And your video is precious! The opening of the presents on Christmas day wore me out! The 3 older kids were sitting fairly still through much of it, but the little one was all over the place. And the cookies looked wonderful! Oh. And your new dress and sandals are beautiful - you look great in them - good choices! haha we had a similar situation here - the little one kept rushing around to grab presents for everyone but he can't read to see who they are for so you had to keep an eye on him! You can see him darting around in the video, haha, so fun. As always, you've nailed it with the styling! Loving this bag too, how cute! I just saw it in your other photos and it's really nice. Thanks! it's such a fun bag, I'm thrilled I scored it on ebay! It looks like you had a wonderful Christmas. I am loving the outfit it is super cute. It's been a while since I went on your blog and I still love it!! I love the hi-low hem on the dress! Very pretty! Happy New Year! Awww I love how different both holiday outfits are: one being more classy while the other one is more cute and casual. Hope you have a happy holiday and wonderful time spent with family. Wow, that's awesome that you dress up on Xmas day. I tend to wear just comfy clothes because I'll be doing much of nothing, haha. This year, it was spent in a bathing suit, but still! Hope you had a merry Christmas. Your hair looks gorgeous! And it sounds like the best Christmas too :) Happy New Year! I love your bags!! <3 First I saw that red one and I loved the colour! But then I saw your Chanel! It is my dream to one day buy a Chanel bag <3 Loved your outfits too! Merry Christmas and happy New Year Mica! Thanks! 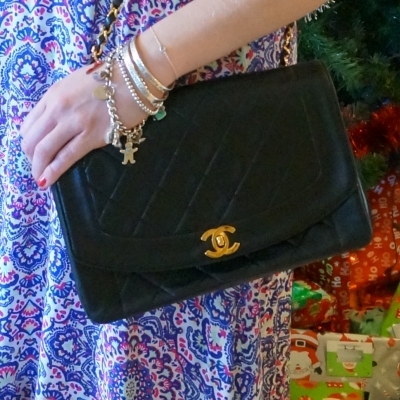 Crossbody bags are awesome, and that Chanel is a standout in my collection! Love them! Glad you had a nice Christmas with your family, and I hope you guys have a wonderful New Year too! Love your Christmas outfit! It looks very festive and cozy, hehe. Your Rebecca Minkoff bag is looking stylish! I love your maxi dress. Glad you enjoyed your Christmas celebration with your family! These outfits are really gorgeous, love the combination of top, skirt and bag in first of them and you look absolutely beautiful in dress from second look! It's such a sweet idea to celebrate Christmas in matching tees. I love also that you wore two outfits that were so different, and yet both are festive in their own way. I'm glad your Christmas was good and I hope you have a wonderful New Year as well. You look wonderful in both outfits! Love your shirt dear, so cute! Your Christmas Eve outfit is so cute! I love your tee and am swooning over your Chanel bag! Cute Santa T-shirt! Two fabulous handbags there! Happy New Year, thanks for linking up! Thanks all for your lovely comments! We had a great Christmas and I hope you all did too.